What is the significance of the tartan? The Regimental tartan is Hodden Grey, which has been worn since the Toronto Scottish Regiment became allied with the London Scottish Regiment in 1921. Hodden Grey, the homespun cloth known throughout Scotland, was chosen by Lt. Col. Lord Elcho of the London Scottish Regiment in 1859. He sought to avoid all interclan feeling on the subject of tartan, and as soldiers, wanted his troops to blend in with the landscape of the battlefield. It is also referred to as the Royal Tartan because only two organizations in the world are allowed to wear it, and only with explicit permission by the Queen. The two organizations are The Toronto Scottish Regiment (Toronto, Canada), and The London Scottish Regiment - A Company, The London Regiment (London, England). The Commanding Officer is responsible for the training, administration, and general efficiency of the Serving Battalion through the Land Force chain of command, and ex-officio is a member of the Senate. 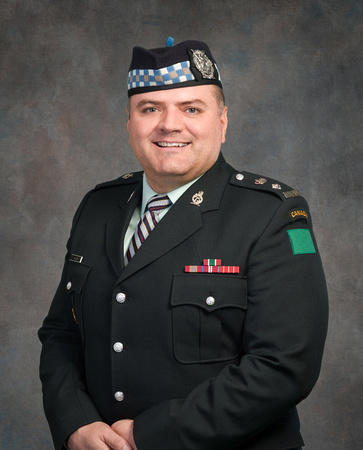 He has under direct command all officers, and non-commissioned members (including members of the Pipes and Drums ) who are members of or attached to the Battalion. He is also responsible for all messes, and institutes within the Serving Battalion. Organizationally the Serving Battalion reports to and is part of 32 Canadian Brigade Group, headquartered in Toronto. In 2003 the Battalion establishment was increased to accommodate the raising of a company-sized sub-unit headquartered in Mississauga, Ontario. A temporary new armoury was officially opened at 3330 Ridgeway Drive, Mississauga on the 22nd of October 2005. The Commanding Officer has a responsibility to the Senate for those matters affecting the Serving Battalion that are within the responsibility of the Senate. Want To Join The Toronto Scottish Regiment? For the challenge of a lifetime join The Canadian Forces Army Reserve with The Toronto Scottish Regiment. Learn hands-on transferable management skills that will enhance your civilian career. Join The Toronto Scottish Regiment, train to serve Canada and the world, meet interesting people, travel the world, make a significant difference to other people's lives, and return home knowing you have made a contribution to helping others who are less fortunate. 3. Have completed at least Grade 10 or Secondaire IV (in Quebec). Several years after National Defence Headquarters granted permission to redesignate the Mississauga Regiment as The Toronto Scottish Regiment, it was suggested that the a regimental church be located. At the time, several regimental officers were members of Knox Presbyterian Church located at 630 Spadina Avenue, just south of Harbord Street in downtown Toronto. It was agreed that they would approach the church session about arranging an affiliation. Soon after receiving The Toronto Scottish Regiment designation on 1 September 1921, the Regiment was granted affiliation with Britain's 14 (County of London) Battalion The London Regiment (London Scottish). At that time we adopted the dress (including the distinctive hodden grey tartan) and customs of The London Scottish with adjustments for local significance. Coincidentally we were granted affiliation with The Gordon Highlanders with whom the London Scottish were affiliated. On a wreath of thistles, the Cross of St. Andrew, charged in the centre with a maple leaf, both interfacing an annulus inscribed with the motto CARRY ON; upon a second annulus placed on the centre of the maple leaf and inscribed BELGIUM FRANCE 1916-1919, a unicom's head couped and gorged with an antique crown chained, and resting on an heraldic wreath; on the upper and lower bends of the wreath and resting on the arms of the Cross two scrolls, the upper inscribed TORONTO and the lower SCOTTISH. Azure a torteau charged with a saltire Argent surmounted by the numeral 75 Or, within an annulus Gules edged, charged in base with a thistle, inscribed THE TORONTO SCOTTISH REGIMENT (QUEEN ELIZABETH THE QUEEN MOTHER'S OWN) in letters Or, ensigned by the Royal Crown and enclosed by two branches of maple leaves in autumnal tints and thistles proper bound by a riband Gules surmounted by a scroll Or inscribed with the Motto CARRY ON in letters Sable, the whole enclosed by two branches of laurel Or fructed Gules each surmounted by ten scrolls Argent edged Or, those to the dexter inscribed in letters Sable SOMME, 1916; ARRAS, 1917, '18; HILL 70; AMIENS; CANAL DU NORD; DIEPPE; ST. ANDRÉ-SUR-ORNE; ANTWERP-TURNHOUT CANAL; WOENSDRECHT; and THE REICHSWALD; those to the sinister inscribed in letters Sable ANCRE, 1916; VIMY, 1917; PASSCHENDAELE; DROUCOURT-QUÉANT; VALENCIENNES; BOURGUÉBUS RIDGE; FALAISE THE SCHELDT; THE RHINELAND; and THE HOCHWALD; all between four representations of the Royal Cypher of Her Late Majesty Queen Elizabeth the Queen Mother Or, its Royal Crown proper. Gules on a Canadian pale Argent a maple leaf charged with an annulus Gules edged, charged in base with a thistle, inscribed THE TORONTO SCOTTISH REGIMENT (QUEEN ELIZABETH THE QUEEN MOTHER'S OWN) in letters Or and ensigned with the Royal Crown proper. No enlisted personnel were on strength, only officers, until the unit’s name was changed and re-designated The Toronto Scottish Regiment. The Battle Honours in italics and bold are authorized to be emblazoned on the Regimental Colours . Honorary ranks in the Canadian Forces have been modeled on the purest British traditions. The first honorary appointment was in 1895. Today major Militia units (i.e. those whose establishments are commanded by a Lieutenant-Colonel) may have both an Honorary Colonel, and an Honorary Lieutenant-Colonel. Prior to the mid 1970s, honorary rank in the Reserves was confined to former officers. Since then honorary status may also be conferred on distinguished Canadian citizens. The handbook covering honorary appointments lists the following as the principal responsibilities for Militia Honoraries: act as an advisor to the Commanding Officer on all matters pertaining to regimental dress and traditions; provide advice on regimental charities and associations; help to maintain close liaison with allied regiments; encourage the Regiment's Cadet Corps; attend formal parades and social functions in which the unit is involved; occasionally attend unit training including field training exercises; take an active part in efforts to improve the Militia, and indeed the Canadian Armed Forces; attend the Honorary Colonels' and Lieutenant-Colonels' conferences, and generally keep abreast of policy developments affecting the Militia. Once a nominee for an honorary appointment is approved by the Regimental Senate, their request is passed to the Commanding Officer for processing through the army chain of command. The Chief of the Defence Staff passes the application to the Minister of National Defence who is the approving authority for such appointments. Once approved by the Minister the appointment is promulgated in Army Orders, and is signified by the issuance of a Commission Certificate signed by the Governor-General and the Minister of National Defence acknowledging the appointment. Such appointment "Gives and grants full power and authority to have, hold, and enjoy said appointment accordingly, together with all and singular the privileges thereunto belonging .... and commands all Officers and Non-Commissioned Members to acknowledge you as such". The Honorary Colonel and Honorary Lieutenant-Colonel personalize the institutional structure of the regiment, assist in the promotion of regimental affairs when the attention of the serving officers is normally focused on training and operational matters, and add a further dimension to the concept of the regimental Family. The role of the Senate is to provide leadership, assistance, and direction in matters of business that affect members of the Regimental Family outside the Canadian Forces chain of command. While the Honorary Colonel is the ranking officer in the Serving Battalion, the Senate and by extension the Chairman of the Senate, is the overall head of the Regimental Family. approving the Commanding Officer’s nominee as his successor to command. the selection and approval of Honorary appointments ie the Colonel-in-Chief, the Honorary Colonel and the Honorary Lieutenant-Colonel. approving any change to dress policies relative to the wearing of our traditional highland uniforms and accoutrements. By definition, this excludes the wearing of Canadian Forces uniforms, authority for which comes under the auspices of the Commander of the Land Staff. approving the nominees for The Queen Mother’s Dish . approving the establishment of any organization which uses the Regimental name in its title. ensuring that Regimental customs, traditions, and history are maintained. maintaining the security of the Hutcheson Victoria Cross, and any other valuable chattels not in the care of the Museum, or the Officers’, or Warrant Officers’ and Sergeants’ Messes. the Senate may authorize the creation and administration of such committees as it deems necessary to maintain and promote the Regiment, its traditions, and to further its interests. dealing with any other matters affecting the Regiment that may surface from time to time, including reviewing the activities of the Foundation , and the Unit Fund. Former Commanding Officers of serving battalions. Honorary appointments both serving and retired. The serving Commanding Officer is ex-officio a member of the Senate. Any other person may become a member of the Senate whose nomination is passed by a majority of Senators present at a duly constituted meeting of the Senate.